We have recently seen an influx of customers contacting us with Grid interactive solar systems that are experiencing GFCI (Ground Fault Circuit Interuptor) faults on their inverters. GFCI faults occur when the grid interactive inverter detects a flow of current between the solar input and ground.? A GFCI fault will shut down the inverter to prevent any risk of electric shocks. The exact cause of the GFCI fault is usually a fault in the wiring from the solar array to the inverter, water intrusion into a connector or isolator, or corrosion in the solar modules. 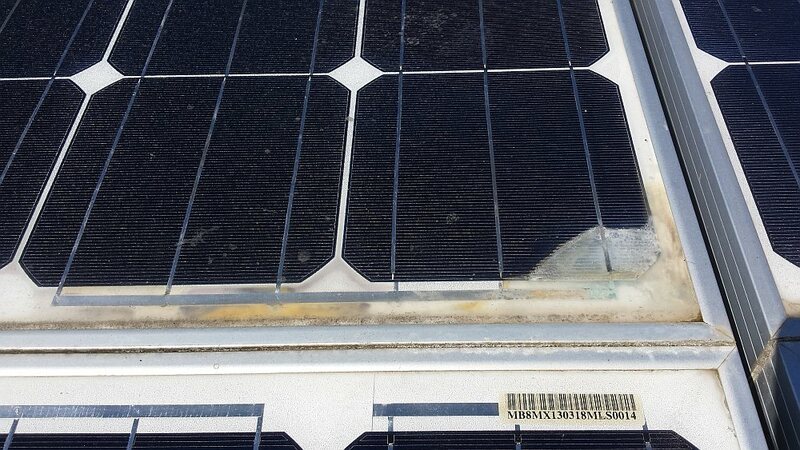 This is an example of corrosion in a solar module that was only 4 years old causing GFCI faults. In rare cases the solar module frame through the corrosion can conduct electricity and induce an electrical shock if touched.? If the solar array frame is attached to a steel roof or building frame then the voltage could be anywhere on the building. Sometimes the GFCI can rest itself the next day and fault again after rain or heavy dew. If you have a GFCI fault, Contact us and have it checked out.